Paul McShane, who scored Castleford Tigers' only try at St Helens. 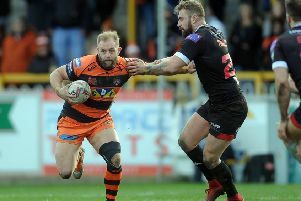 Castleford Tigers players have been backed to respond positively after their opening round horror show at St Helens. A home game against Widnes Vikings this Sunday gives the Tigers a chance to redeem themselves in front of their own supporters and head coach Daryl Powell believes they will take it. Powell was unhappy with the attitude of his players in the 46-6 drubbing at the Totally Wicked Stadium, but believes hard talking and hard work on the training pitch this week will put that right to ensure an improved display this Sunday. “We’ve trained well this week,” he said. “It was obviously pretty disappointing for everybody last week and it’s difficult to see past us going there and getting our backsides spanked. But I think we’re ready to go and the attitude to training’s been awesome. “We know what we can do. We will make some changes in the team to make a difference to the make-up of it and I think the overall attitude is going to be a fair bit different, which will make a huge difference to us. “It was a disappointment no doubt about that, but the players have just got on with their task and there’s been a good focus about us in practice. Powell is confident that fans will see a motivated Tigers team take the field on Sunday. “St Helens certainly played like a highly motivated team last week and I didn’t think we did particularly. That’s something we’ve had to address and make sure that doesn’t happen again. “I don’t think it will. We’ve got a group of blokes who’ve shown they can play to a high level and we’ve got to make sure we do that on a consistent basis. “We just want to play now. You have a performance like we did and you just want to get back out on the field, it’s the only way you can put it right. “It’s our first home game, we’re proud of our record here and we want to play well in front of our fans, that’s for sure.